This entry was posted on July 8, 2011 by Karen Rivera. 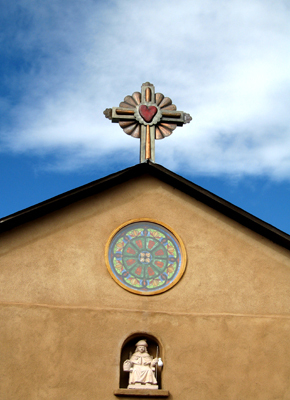 It was filed under Adobe Churches, Art, Churches, Cross of the Day, Crosses, CrossoftheDay, Descansos, Folk Art, Hand Carved Crosses, Heart Crosses, Historic Churches, k.d. sebastian, Karen Rivera, Mission Churches, Mountain Churches, Mountain Splendor, New Mexico, Northern New Mexico, Our Savior, Patron Saints, Religious Art, Rustic Crosses, Saints, Saints and Martyers, Sanctuario, Santos, Spirituality, Traditional Crosses, Village Churches and was tagged with Abobe Churches, Chimayo Chapel, Christian Crosses, Cross, Cross of the Day, Folk Art, God, Mission Churches, Mountain Churches, New Mexico, Northern New Mexico, Old Churches, Prayer, Religious Art, Tinwork.